These were the instructions of the dying ancestor Maniapoto to his people. Such strength of purpose characterises much of their history, including their early economic success, protecting the King Country, and preserving their culture. Te Kūiti in the central North Island lies at the heart of Ngāti Maniapoto territory. The western boundary is the coast from Kāwhia down to Mōkau. To the east is the Rangitoto Range. It was believed that lightning over the range was a sign of death. 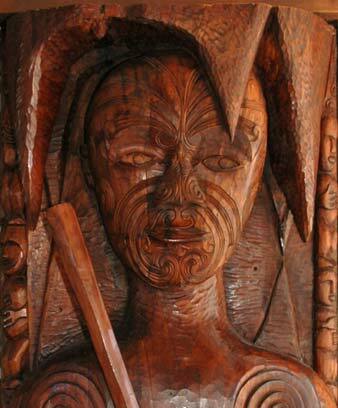 Ngāti Maniapoto trace their lineage back to the Tainui canoe, and particularly to Tūrongo. The ancestor Maniapoto lived in the 17th century. In a famous incident his father, the chief Rereahu, passed on his sacred power to Maniapoto, although the usual custom was to hand it to the oldest son. Rereahu told Maniapoto to bite the crown of his head, which was painted with red ochre. Maniapoto’s red lips were a clear sign that he was the chosen chief. Settlements were clustered around harbours and fertile river valleys such as the Waipā, said to be the home of Waiwaia, the tribal guardian. Some European settlers married prominent women of the tribe, producing several important Pākehā–Māori families. A trader of French descent, Louis Hetet, married Te Rangituatahi, a chief’s daughter, and in the 20th century one of their descendants, Diggeress Te Kanawa, became famous as a skilled weaver. In 1857 the tribe supported the establishment of a Māori king as part of their effort to stop settlers buying up their land. They set up a boundary around the King Country, or Te Rohe Pōtae, to keep out Europeans. This remained until 1883. In 2013 this large tribe had over 35,000 members, with the central marae at Te Kūiti. Many have moved away from the ancestral lands, but the Maniapoto Māori Trust Board ensures the tribe’s identity and interests are protected. Every two years many people return home to attend a sporting festival and celebrate being Maniapoto.